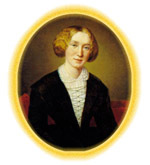 Throughout her novels, George Eliot points out the deplorable state of education for women in the nineteenth century and the effects that poor education has upon the individual. Only limited schooling, if any, was available to girls whose parents could not afford to pay substantial sums, and too much schooling for girls was commonly viewed as unnecessary and even dangerous. In addition, schools generally spent a large proportion of their time teaching various "accomplishments" and very little on more academic subjects. Characters in most of Eliot's novels reflect common perceptions on education for women and illustrate the undesirable results of inadequate or inappropriate schooling. Tulliver earlier told his wife that Maggie is "twice as 'cute as Tom. Too 'cute for a woman, I'm afraid" (Mill 11). Tom Tulliver feels threatened by his sister's abilities with books. In an attempt to obtain support for his belief that girls are too silly to learn subjects such as Latin, Tom appeals to his teacher. Mr. Stelling pleases Tom and wounds Maggie by stating that girls "can pick up a little of everything, I daresay .... They've a great deal of superficial cleverness; but they couldn't go far into anything. They're quick and shallow" (Mill 132). Many of Eliot's male characters prefer women who lack education or even intelligence. Tulliver describes his wife to Mr. Riley: "I picked her from her sisters o' purpose, 'cause she was a bit weak, like; for I wasn't again to be told the rights 0' things by my own fireside" (Mill 17). Harold Transome in Felix Holt does not want any competition from women; he is interested only in subservience (292). He tells his independent-minded mother, "I hate English wives; they want to give their opinion about everything. They interfere with a man's life" (19-20). All too often, this opinion was shared by both men and women.